clean 180 times more aquarium area in a single dive! 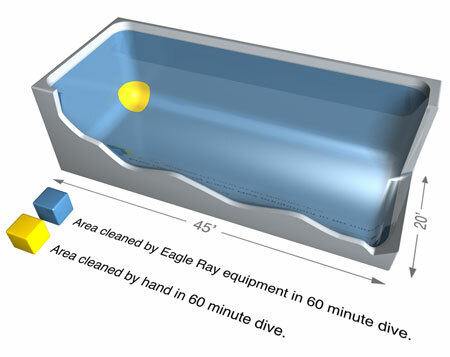 This means more of your aquarium is being cleaned by less dive time. Your aquarium is cleaned faster. Divers are free to perform other more important tasks. With less dive time required, less diver supervision is required. Less air is consumed per month, saving your institution on operating costs. The equipment is ergonomically designed. This design will eliminate the instance of carpal tunnel syndrome that is associated with hand scrubbing. With less dive hours required the chance for a dive related accident is greatly reduced. The best tool is the SAFEST tool. At Meridian Sub Tek, diver safety has always been our foremost design consideration followed by ergonomic function. We have incorporated a number of features that make our equipment safer than any other manufacturer’s equipment on the market today. The design of our scrub head is inherently safe, and ergonomic function has been added for diver comfort. Our engineering department has incorporated a “dead man” on/off switch into our submersible scrub head. When a diver lets go of the trigger, the motor stops spinning. The counter rotating brushes are extremely stable and eliminate torque steer. The angled handles, combined with the counter rotating brushes, eliminate diver fatigue. The electrical controls on the power cart are all waterproof (NEMA4X). The start button, low water light and the stop button are all low voltage (24VDC), thus eliminating any potential for shock hazard. A GFI circuit protects all of the electrical controls and operator in the event of a water based short circuit.